Westlers has recently teamed up with Exeter-based family attraction Crealy Adventure Park & Resort on its street food offering, building a snacking experience based around the new ‘Driving School’ attraction. 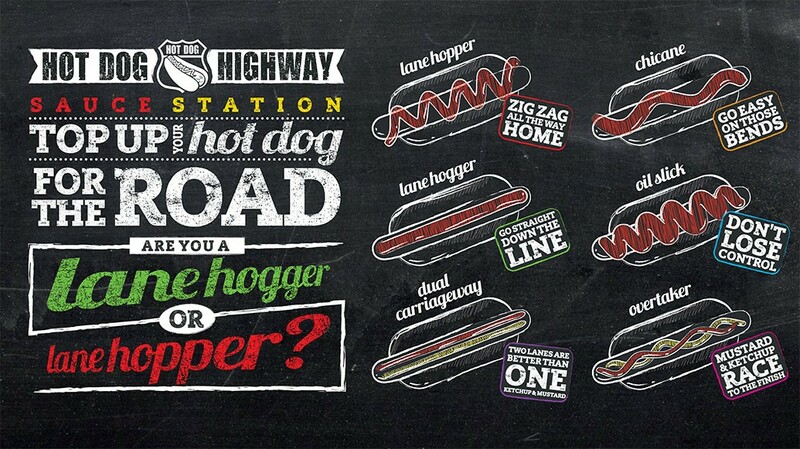 We developed the concept of the Hot Dog Highway, a place where you can fill up for the road, complete with bespoke POS, which encourages customers to pick from a set gourmet menu or to personalise their hot dog to suit their own taste. Customers are also encouraged to have a little bit of fun with their hot dog, at the sauce station. 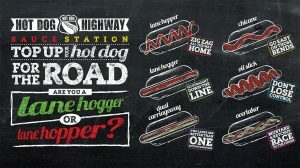 Here they decide whether they are a lane hogger (a straight line of sauce), a lane hopper (a zig zag of sauce) or an overtaker (a double zig zag of mustard and ketchup) to name a few. This final stage of the process injects some real customer engagement and ties the product in perfectly with the park’s attraction, helping to make the snacking occasion a fully integrated part of the park experience. Elevating the humble hot dog into a engaging and fun street-food staple in this way allows Crealy Park to offer their customers something special that appeals to their target audience and allows them to have their dog, just how they like it. Our concept works because it leverages our brand’s strengths as a food manufacturer together with our customer’s brand strengths as a provider of exciting family fun days out. Working together we have managed to create an engaging experience that looks less like your normal ‘drop shop’ branded concession and more of a bespoke, fully integrated offer. By developing the food offer in this way we hope to encourage uptake and provide customers with something different that will stay with them as a memorable part of the park experience. For more information on how we can help you make the most of your hot dog offering, please call 01536 463 080.